Republican National Committee Chairman Reince Priebus is introduced by Maine GOP Chairman Charlie Webster Friday, Sept. 28, 2012, at the Republican Victory Center in Westbrook. Speaking to approximately 40 Republican loyalists, including 1st District U.S. House candidate Jon Courtney and Maine Republican Party Chairman Charlie Webster, Priebus returned to his “battle for freedom” metaphor five times during an address that lasted about 10 minutes. He criticized President Barack Obama as a man “who likes to hear his own voice and can’t keep a promise” and praised Republican presidential nominee Mitt Romney as “absorbed in what being a president means” before moving on to praise Maine Republicans. “It’s amazing how red this state has gotten in two years,” he said. Most of those in attendance were campaign volunteers, some of whom worked the phones right up until Priebus entered the room, then resumed calling potential voters as the Wisconsin native left for the airport and a flight to his next campaign stop. Priebus touted volunteer efforts such as the Westbrook operation, one of 10 GOP “victory centers” in Maine, according to David Sorensen of the Maine Republican Party, as proof that Republicans “have an army on the ground.” He said that the RNC has $77 million left for “get out the vote” and early voting efforts during the “last push” to Election Day. Priebus said that figure far exceeds what the Democratic National Committee has on hand for the final five weeks of the campaign. Leland Graves, a volunteer at the Westbrook site, earned special praise from Priebus and cheers from the crowd for making the most calls on behalf of Republican candidates in Maine. Priebus offered few particulars on how Republicans would close the margins between incumbent U.S. Rep. Chellie Pingree and Courtney in the 1st District or between incumbent Democratic Rep. Mike Michaud and Kevin Raye in the 2nd District. Courtney said he ate lunch with Priebus on Friday and was encouraged by their conversations, but that the national party chairman did not commit any new money to the Sanford Republican’s underdog campaign against Pingree, whose campaign had outraised Courtney’s by more than 10-to-1 at the last reporting deadline. When asked about recent poll results that show Raye trailing Michaud by almost 20 points in the 2nd District, where Republicans had hoped to pick up a seat in the U.S. House and perhaps an Electoral College vote, Priebus said that the party has its own polls that offer a more upbeat picture. Earlier this year, Raye was named one of the Republican party’s promising “Young Guns.” He also received outside advertising support from the National Federation of Independent Business and an endorsement from the U.S. Chamber of Commerce, but his campaign has yet to see the type of national financial support that Republican Charlie Summers has in the U.S. Senate race. Polls show Summers trailing independent former Gov. Angus King in the contest to replace Republican Olympia Snowe in the U.S. Senate, with Democrat Cynthia Dill and three other independent candidates far behind. Until Snowe announced her decision to retire earlier this year, Republicans considered the seat a lock in their national struggle to gain control of the Senate. Now, it’s very much in play, and polls that show Republicans facing challenges in states where they once thought they held firm advantages, coupled with some polls that show Summers narrowing the gap on King, elevates the national stakes in Maine. The National Republican Senatorial Committee so far has spent about $680,000 on the two ads that go after Angus King and his wind dealings. The U.S. Chamber of Commerce also has purchased ads critical of King. Priebus repeated some of the accusations the ads made against King, specifically that he left Maine with a deficit in 2003 at the end of his eight years as governor. 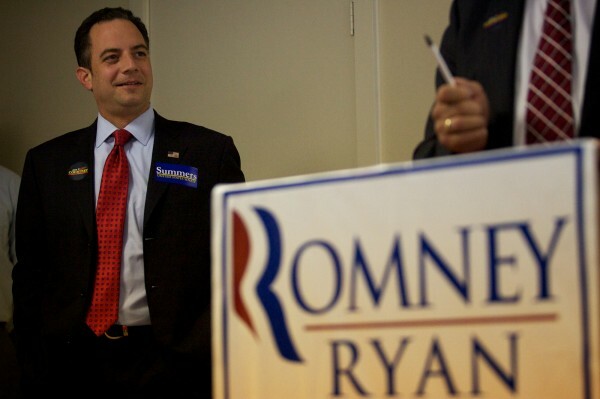 Priebus also said he has not spoken to Snowe about an endorsement for Summers. He declined to answer a question about whether discontent among Ron Paul supporters who were stripped of their seats as delegates at the Republican National Convention in late August posed a threat to GOP unity in Maine. Asked if the party planned to send any other heavy hitters to Maine to help during the final weeks of the campaign, Priebus noted that Romney’s son, Tagg, had accompanied him to Maine today. “All I know is that I’m in Ohio tomorrow,” he said.